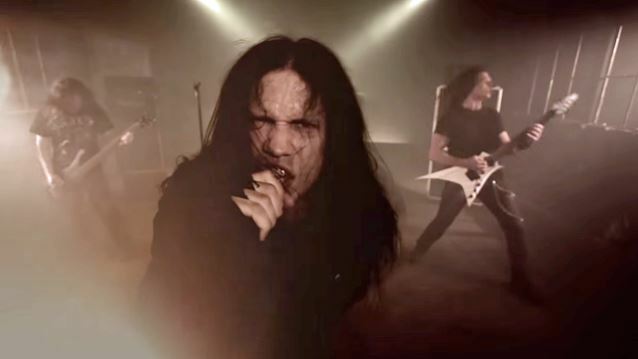 "Throwback", the first video from ACT OF DEFIANCE, the band featuring former MEGADETH members Shawn Drover (drums) and Chris Broderick (guitar), alongside ex-SCAR THE MARTYR singer Henry Derek Bonner, and SHADOWS FALL's Matt Bachand (bass), can be seen below. 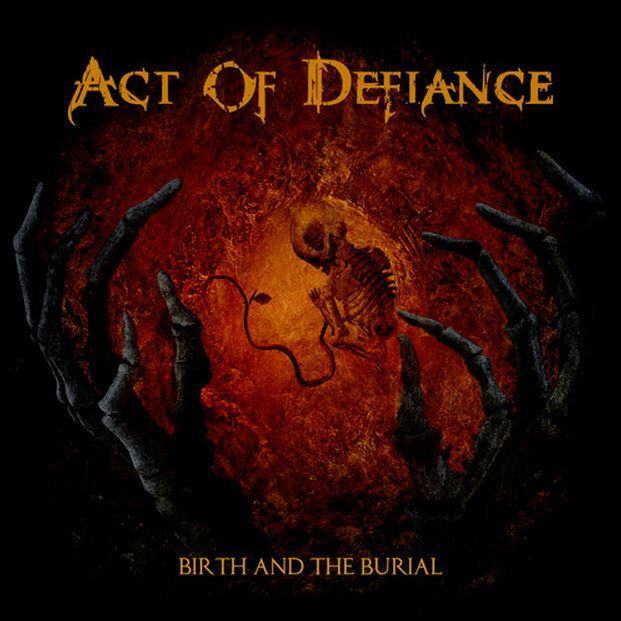 The song is taken from ACT OF DEFIANCE's debut album, "Birth And The Burial", which will be released on August 21 via Metal Blade Records. The clip was shot by renowned director Corey Soria (DANZIG). Drover states: "'Throwback' is not your average speed/thrash metal tune. The song is also pretty progressive at times, with a lot of stopping and starting going into the bridge, and they are all at different times, so we really had to memorize the count." He continues: "I was really impressed with the way Chris wanted to write a little bit out of the box, shall we say. Chris also wrote all of the lyrics for the song, which were also impressive to me. They are certainly dark in the subject matter, as they should be to fit the aggressiveness of the song. Quite a nice fit, if you ask me. "Making the video in L.A. for 'Throwback' with Corey was the easiest and most focused video shoot I have ever been a part of. The concept was very 'old-school metal' in nature, with just smoke, lights, the band and METAL! What a concept. We all shared the common vision of just being a metal band captured on film and Corey got it right away. Corey and his entire crew were a sheer joy to work with." 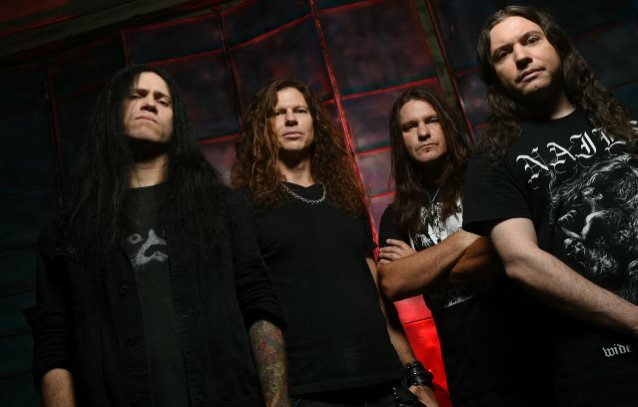 Broderick adds: "'Throwback' came about through the influence of great thrash players such as Kerry King (SLAYER) and Rob Cavestany (DEATH ANGEL). They gave me the inspiration to write a tear-your-head-off, insanely fast rhythm. 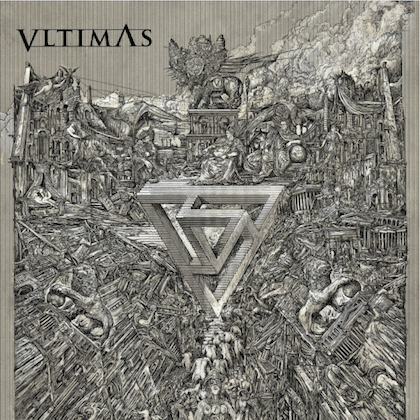 From there, it progressed, as I wrote, into a song that doesn't only have elements of thrash but everything in between with elements of progressive, and groove." He continues: "I never expected 'Throwback' to be the first release off the CD, as it's not commercial, doesn't follow a typical verse-chorus-solo scheme, and is almost six minutes long. However, when you hear the fire, emotion and brutality of the song, it becomes very clear that it was a contender to show people what ACT OF DEFIANCE is really about. "It was awesome working with Corey Soria on the music video. He had the same vision as us and understood immediately what the song was trying to say and how it should look. Along with the insight he had, there was a tireless work ethic, doing different angles, pans and trying new ideas as he conceives them is an art in itself. "When we looked at the first edit, my jaw dropped and then he came back with more that included post editing FX that added to the mood. From the camera angles, to the lighting and editing, this video far surpassed what I hoped for." Pre-order the album at MetalBlade.com. In a time of endless sub-genre classifications being thrown at bands, ACT OF DEFIANCE cut to the quick, offering 100-percent in-your-face, uncompromising metal. "If you invited fans of all kinds of metal — from thrash to Scandinavian metal to modern American metal — and had them all in a mosh pit, ACT OF DEFIANCE would be their soundtrack," asserts Broderick. Having a deep-seated respect for each other, Broderick and Drover share a very complementary writing style, instinctively getting where the other is coming from. "Shawn knows metal inside and out," says Broderick. "He's always been a metalhead, so we come from the same musical background, and we get that world. We didn't really talk about what we might do next until after we had both left MEGADETH, and we were like, well, we came up with all of these great riffs for MEGADETH that were never used, so we decided to use some of those for the basis of what we were going to do with ACT OF DEFIANCE. Out of that spawned a burst of creativity and a lot of newer material, and it was all really exciting and what we really wanted this band to be." Drover is very much on the same page, believing the two have a special chemistry that goes beyond their musical collaborations. "Having the same vision of what we want to do musically, from a business perspective, and in terms of what we want to achieve with this band, is a really important factor," he says. "It means we can concentrate on making the best music and we can and look at the overall picture, instead of squabbling about who should get more songwriting credit and unimportant crap, which often leads to the demise of so many bands. As far as we are concerned, the body of music we create is what matters." While Bachand is better known for his work on six rather than four strings, coming into the band he stepped up straight away, impressing Broderick and Drover with his adaptability and playing style. "I'd met Matt many times before and he's a great guy and an all-around great musician," Chris says. "He plays bass like a bass player, which was awesome for me, because when I demoed the songs it was pretty much laying down the bass just so it had some lower notes and then moving on! But he came in and he spent the time and made them into really nice bass lines that added an extra dimension to the songs, which not all guitarists can do, and he really gets what we're trying to achieve with this band." The final piece of the puzzle fell into place with Henry Derek Bonner, who was recruited following an extensive search. Determined that the band needed to be fronted by a vocalist who was not limited to the standard practice of screamed vocals or clean vocals, they demanded versatility, and Derek delivered. "We started from a list of I'd say 30 vocalists, and we worked that down to a shortlist, and we sent everyone on that a demo to lay some vocal tracks over, and when they all came back we knew Henry was our guy," Drover enthuses. "He can do the super-heavy, growling vocals, he can do the really melodic clean vocals, but he can also do everything in between, and he has the ability to really build and shift within that range," adds Broderick. "The other really cool thing I really like is that his really heavy singing still has pitch to it. There are these really melodic lines even in his heaviest vocals." It takes only one exposure to "Birth And The Burial" to become abundantly aware that this is not the sound of a bunch of guys screwing around. Kicking things off with first single "Throwback" they throw down the gauntlet, the track erupting in a cascading lead before launching into a breakneck thrash attack, sounding very much like four guys ready to fight, its massive chorus only upping the ante. 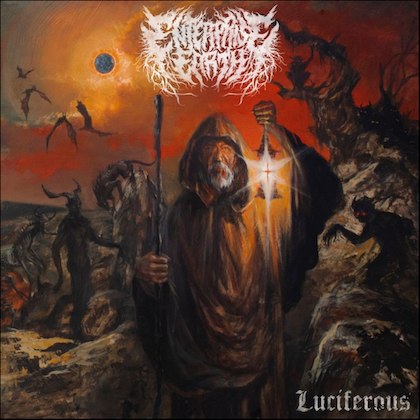 The merciless intensity displayed is a mode they return to often, "Thy Lord Belial", "Dead Stare" and "Disastrophe" particularly upping the adrenaline and sure to cause mosh pit carnage. 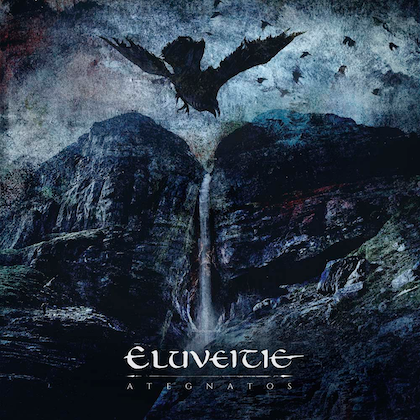 However, groove and dark melody are as important as flat out riffing, kicking up plenty to inspire mass headbanging and fist-in-the-air excitement, and they also have their more brooding, atmospheric moments, "Poison Dream" and "Obey The Fallen" possessing a somberness alongside their compelling sonic violence. Fans of Broderick's previous work are aware of his incredible talent when it comes to shredding, and on "Birth And The Burial" he unleashes some of his most breathless and compelling soloing to date, finding the perfect marriage between technicality and melody. "I really loved the luxury of being able to look at the rhythm behind the solo and have it support the kind of soloing I wanted to do," he says. "What I really like to do is listen to the rhythm and imagine what I want to hear, whether it's a harmonic, rhythmic kind of sixteenth note kind of thing, or a melody that is really haunting and eerie. After I flesh some of that out I let my inspiration take me as I'm creating the solo. I've never been one to typically improv a solo and say that's it, and I wanted every one on this record to really have a life of its own." Thematically, the band explore their own personal experiences, focusing on some of the harder truths, the aggression of the music the perfect vehicle for expressing such sentiments. "'Poison Dream' is about somebody being consumed by a dream of fame or power or money, and how they will sacrifice anything to get that, while 'Legion Of Lies' is about a person who is constantly casting out negativity and betrayal and trying to deceive those around him, but we hope that fans will take these lyrics and put their own personal meaning to them," Chris says. "You never want to make them so specific to any particular situation, and I think a lot of these experiences are really relatable." The album title is lifted from the anthemic closing track of the same name, focusing on a person burning their bridges with friends and those they have worked with in past, and asking them to look for forgiveness before it's too late. "The line 'you reap what you sow, the birth and the burial' — to me, that really sums it up, because what you do in life will reflect in the time that you die, and I thought that was really cool in the way it tied into the record," Broderick says. With recording split between three studios in three different states, Broderick handled vocal and guitar production at his own Ill-Fated Studio in Los Angeles, Chris "Zeuss" Harris (ROB ZOMBIE, REVOCATION, MUNICIPAL WASTE) worked with Drover tracking the drums in Dexter's Lab in Milford, Connecticut, while Bachand laid down his bass at ManShark, in Southampton, Massachusetts. While the band had a lot of work to do, when they headed into the studio things ran very smoothly. "We had pretty much everything demoed by the time we started recording," Chris says. 'We would change things as we were doing the final takes, but for the most part we knew exactly what we were playing, and from there it was a case of making sure we got really good takes." With artwork courtesy of Travis Smith (AVENGED SEVENFOLD, STRAPPING YOUNG LAD) and their logo and emblem the work of Van Williams (formerly of NEVERMORE and currently of GHOST SHIP OCTAVIUS) the band focused on ensuring every element of their presentation had meaning to it, wanting to offer fans the proverbial full package, and they have every intention of being around a while. "I want ACT OF DEFIANCE to be a hard working, heavy metal road-dog band, and we really do have what's almost a blue collar sensibility and perspective," Drover states plainly. "We know we are going to have to earn this and that we can't rest on what any of us have done previously, and that is something we are more than willing to do. Believe me."